The panel consists of three judges. The judges are well respected professionals and leaders within the Taiwanese American community who volunteer their expertise and time. They do not receive compensation from THSH. There are three judging criteria. They include academic merit, community service, and cultural identity. Different components of the application are assigned points based on how well they demonstrate the applicant’s qualification. The criteria are not weighted equally. In the 2016 program, the point distribution is detailed below. Annually, the scholarship committee reviews this system and modifies it as necessary. 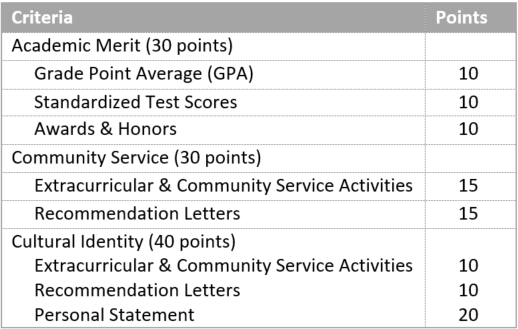 THSH uses unweighted GPA’s on a 4.0 scale and will convert GPA’s to a 4.0 scale if a school uses another point system. In addition, all weighted GPA’s are converted to unweighted GPA’s. Students may submit SAT, PSAT, or ACT test scores. Since the PSAT is taken before the senior year and contains testing materials of slightly different standard from the SAT, results of the PSAT (commended student, semifinalist, finalist) will be judged in the awards & honors section and not included as part of the scoring for standardized test scores. The Scholarship Committee does not take into consideration the “writing” score in the SAT score report. The student is assigned points based on the sum total of the best SAT verbal and math scores. THSH uses the composite ACT score. Many applicants have taken advanced classes and the scholarship committee has devised a system to recognize such accomplishment. Students are awarded points based on the rigor of the advanced, honors, gifted AP, and IB courses they take in their sophomore, junior, and senior years of high school. The students will be awarded points for national, regional, state, local, or any other honors bestowed or awards won. Judges award points for evidence of sustained effort, achievement in one or more fields, social and intellectual value of the activities, and leadership. Most importantly, judges place emphasis on and assign higher point values for demonstration of strong cultural identity to Taiwanese or Taiwanese American heritage and commitment to remaining engaged in the Taiwanese or Taiwanese American community. Students may receive points for unusual conditions or circumstances. Points may be awarded for a disability, a traumatic illness, chronic health condition, divorce or death in the immediate family, numerous high school transfers, special financial needs, etc. It is up to the judges’ discretion to allocate points in this area. The scholarship committee strives to make the judging and scoring procedures as fair and objective as possible. At the end of each reward cycle, all judges are asked to complete an evaluation of the process and make suggestions for improvement. The committee also welcomes feedback from applicants.